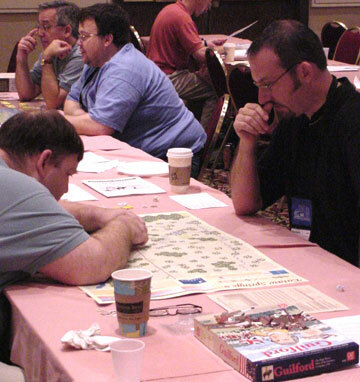 Twenty-six players fought the battles of the "American Revolutionary War Series" by GMT Games. This was the largest field of competitors to-date. The single elimination tournament featured Saratoga in the 1st round. The British took a slight edge in wins, 8:5. All victories were marginal except for the game between Assistant GM Rob McCracken and Charles Ellsworth where McCracken's British won a substantial victory by driving American Army Morale to 0. 13 winners met to fight the battle of Eutaw Springs. GM Mark Miklos, the most recent past-champion present, took the bye while the other 12 were seeded according to a point system coming out of the 1st round. Not surprising for a game as well balanced as Eutaw Springs, there were two British wins, two American, and two draws. This time the only marginal victory was Eric Kleist's British win over Ric Manns. Bruno Sinigaglio's British and Rod Coffey's Americans won substantial victories as did Dale Long, whose Americans upset Assistant GM and past champion John Vasilakos, knocking him out of the competition. Nine players then met across the frost-covered ground at Guilford Courthouse for round 3. With Vasilakos out and no other past champion present, the bye went to Bruno Sinigaglio who advanced out of round 2 with the highest point total. The British side won marginal victories in all four matches played. This was quite a feat since tournament rules stipulated that a draw at Guilford would be scored as an American marginal victory. Advancing out of this round were Mark Miklos, William Riggs, Rob McCracken and Dale Long. As round 4 was about to begin Rob McCracken had to default in order to honor a family commitment that took him away from the convention for the next several hours. We were all sorry to see him leave but his departure returned the field to an even number of players for the semi-final round. Miklos faced Sinigaglio and Dale Long faced William Riggs at the battle of Brandywine Creek. The "Tournament Scenario" was used which gave the players the feel of the full campaign game in half the time. Long's and Miklos' British prevailed with marginal victories setting up the event final. 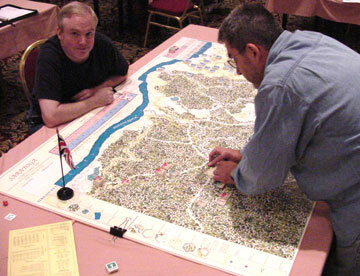 The final match was once again the battle of Saratoga and was played on the GMT demo-set, a 6'x 4' version of the game. While previous rounds had been limited to three hours, the final was untimed and lasted from 9 PM Saturday to 1 AM Sunday. The large version of the game drew a small crowd of spectators giving the match a real "finals" quality. Miklos bid 0 for the British and Long 0 for the Americans so the match began with each army at its full at-start Army Morale. There was moderate fog on the battlefield for the first two game turns that slowed the British advance. Nevertheless, by the end of turn 4, the British were fully deployed in line of battle across Freeman's Farm with their flanks overextending Benedict Arnold's advanced wing of the American army. Long judiciously pulled back to avoid being overlapped. In true 18th century fashion, the two armies maneuvered for advantage. The Americans at one point attempted to "slide" past the British line under cover of the heavy forest to thrust at the British baggage camp on the Hudson River. That objective hex represents a decisive victory for the Americans if they can take it. Miklos committed two regiments being held in ready reserve and sealed off the threat. Long maneuvered his Americans with good effect, anchoring their flanks in such a way that if the British attacked there in force their proximity to the main American positions on Bemis Heights would trigger the "release" of General Gates and the remaining two-thirds of the American Army. He also stubbornly clung to a critical ford over the Middle Branch near the center of his line. By holding that post, he was able to gain a DRM to the "Gates Release" die roll. Indeed, Gates did release on Game Turn 10 (5 PM) at approximately the time he did historically. Casualties had been moderate to this point with the British enjoying a slight advantage. Each army had gained and spent Momentum several times, including using it to influence the "Initiative" die roll in order to enjoy back-to-back moves. For a time it felt like two heavy weights pummeling each other with body punches waiting for the chance to land a knock-out blow. At one point Long's American Army Morale had fallen into the middle of the Fatigued scale but through careful maneuver and judicious attack he was able to climb back into High Morale status only to slip back again as the British continued to play to win rather than playing to avoid losing. The final act in the drama occurred on Turn 11 (the next to last game turn). General Arnold and Morgan's Rifles had been driven back in the center, the American right had been locally turned, and on the American left General Gates, now at the front, was attempting to encircle some over-extended British regiments. As luck would have it, Gates and the regiment he was leading became casualties. The loss of Gates triggered a 3-point drop in American Army Morale that took them down to the edge of Wavering status. In that condition, and with only one turn remaining, Long felt he could not overcome the victory point deficit then in play (British 9, Americans 3). He offered an honorable surrender that Miklos was glad to accept. This was Dale Long's first Saratoga tournament. He is a force to be reckoned with. Congratulations for a well-deserved second place finish.